From Charles Hugh Smith at the OfTwoMinds.com blog, here's a report from Ray W., an energy consultant. It offers some hope that the United States can overcome its oil addiction, with smart planning and effective leadership. Can we do it? Time will tell. 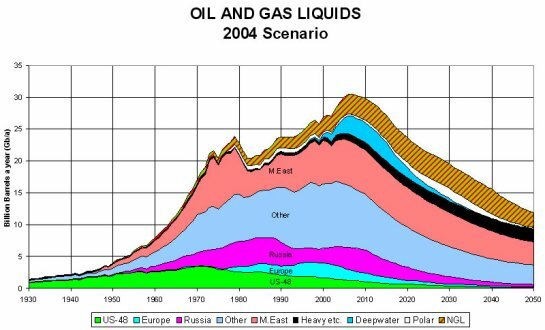 I try to understand the key dynamics of the energy marketplace because I believe that we have reached peak oil and the modern countries are so dependent on fossils fuels. The report below seems to be very objective. I worry that the Saudis and big oil companies have so much influence in our government that our energy policy will remain the same, until we run out of money. Of the three main fossil fuels, natural gas is uniquely situated. Oil is nearing peak production. To find new reserves, companies such as BP, Shell, and ExxonMobil venture into ever more hostile environments, both physical and political, spend ever higher amounts of money, and take ever greater risks. Deepwater Horizon, the oil platform that detonated and sank in the Gulf of Mexico and spewed four million barrels of crude into one of the world’s most productive fisheries, is a tame example. For real expense and environmental risk, look at the tar sands in Canada; for political risk, look at the Niger Delta. The increasing cost of oil exploration and production will consume a larger share of GDP, just as health care does, and if we continue to expand our dependency on oil, we will continue to erode the standard of living for all but the very wealthy. The trajectory of the price of oil is structurally upward. Coal is simply nasty. It’s advantage: it’s plentiful and therefore cheap. Otherwise, it’s a supremely destructive substance at all stages of its exploitation, from mining to transport to combustion to ash disposal. Natural gas is far more plentiful than oil and far less environmentally destructive than coal. Gas produces about 40% of the carbon dioxide of coal for the same kilowatt-hour of power generation. It leaves no solid waste at all, unlike coal, which leaves tremendous piles of ash that must be disposed of and that are susceptible to environmental catastrophe. The Kingston spill in 2008 deposited 5.4 million cubic yards (about four times the debris of the World Trade Centers) in the Emory and Clinch Rivers in Tennessee. Gas contains no mercury, lead, arsenic, or other heavy metals as does coal. At pipeline quality, its combustion produces no sulfur dioxide (the main cause of acid rain) and far less nitrous oxide (the main cause of smog) than coal. Gas is transported by pipeline, which is extremely efficient. Pipelines, being underground, are also visually and logistically unobtrusive and, despite the recent tragedy in San Bruno, California, generally safe. Far more people have been killed in coal-related accidents, not to mention aviation or automobile accidents, than have been in gas-related accidents. Now we come to extraction, where things get more complicated. In the past three years, the amount of natural gas produced in this country has increased 16%, from 18 to 21 trillion cubic feet. This is attributable to recent rapid advances in two drilling techniques: horizontal drilling and hydraulic fracturing. The high price of gas earlier in the decade spurred the development of these technologies, which extract gas from solid rock, rather than from conventional pooled deposits. Extraction presents some serious environmental issues. Some gas deposits contain a fair amount of sulfur, which must be removed and disposed of. Most extracted sulfur is made into sulfuric acid for industrial purposes. Other deposits contain carbon dioxide in quantities as much as 12 percent by volume, which reduces the resource’s greenhouse gas advantage. And it takes a great deal of energy to drill for gas. The rigs generally run on diesel. The recently developed techniques for extracting gas from shale formations also consume large amounts of water. That said, gas extraction doesn’t use nearly the amount of energy or water as coal mine excavation. Water will be the limiting factor for expanding gas production in the United States. Some shale gas producers have been working diligently to find environmentally acceptable ways to minimize the use of water, mostly through reuse. In shale gas production, the water is injected under pressure to fracture the rock, which liberates the gas. The injected water contains several chemicals to provide for the optimal viscosity to enhance fracturing while still being liquid enough to withdraw easily. Most producers use less than a dozen chemicals, which comprise 0.5 percent of the injection stream. The very high numbers of chemicals (approaching 600) quoted in the film "Gasland" are an amalgamation of all the chemicals ever used for fracturing across the industry. Some producers are racing to gain first-mover advantage in the shale plays, which seem to pop up every three months. These producers tend to be less cautious than others, and this is how accidents happen. But there is nothing intrinsically more hazardous or risky about drilling for gas in shale formations than drilling for conventional gas, or drilling for oil, or mining for coal. Gas-bearing shale tends to be several thousand feet (one to two miles) below the aquifer. There is virtually no way for the gas to migrate into the aquifer except through the vertical component of the well that penetrates the water table en route to the gas resource. Gas wells, like oil wells, are encased in cement to protect the surrounding ground from seepage. Sloppy procedures can result in bad cement jobs. But this risk is present for any gas or oil well; it is not particular to shale gas. The United States can substantially reduce oil usage and coal usage and improve carbon dioxide emissions by increasing the production and consumption of natural gas. We can reduce carbon dioxide emissions by 20% within weeks, simply by switching about 15% of coal-fired electric generation to gas-fired, using existing spare capacity in the gas-fired fleet. There is plenty of gas to make this happen without risking huge price run-ups. Gas prices on average might move up about $1.00 per MMBtu, from the $4.00-$5.00 range to the $5.00-$6.00 range. While this would be a 20-25% increase, other costs would go down, specifically the costs of coal-caused pollution. This does not consider the future value preserved by slowing climate change. Also, increased demand would spur increased production, which would moderate such price increases. Eventually, gas use will have to be reduced if we are to avoid the worst of climate change. Increased gas use is a transitional strategy for the next 20-30 years, to provide time for renewable energy and efficiency technologies to be developed and deployed. However, even at that point, gas would still have a role. It is the logical fuel to use to complement the intermittent nature of renewable electric generation. Technological improvements are likely in electric storage, but electric storage is unlikely to be economical enough to span all 24 hours of the day. Gas, delivered through pipelines, is an on-demand electric generation fuel, unlike coal or oil, and can respond instantaneously as minute-to-minute consumer demand and renewable generation fluctuate. If we craft public policy to favor gas to displace coal and oil, we have to be careful not to grow complacent. Gas is not a panacea for climate change. It is still a fossil fuel. However, it is a readily available, pragmatic, interim solution as we move to renewables and efficiency over the next 20-30 years.